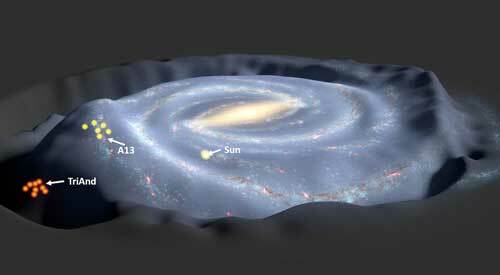 (Nanowerk News) An international team of astronomers led by the Max Planck Institute for Astronomy (MPIA) has made a surprising discovery about the birthplace of groups of stars located in the halo of our Milky Way galaxy. But in a study published in the journal Nature ("Two chemically similar stellar overdensities on opposite sides of the plane of the Galactic disk"), astronomers now have compelling evidence showing that some of these halo structures actually originate from the Milky Way's disk itself, but were kicked out. "This phenomenon is called galactic eviction," said co-author Judy Cohen, Kate Van Nuys Page Professor of Astronomy at Caltech. "These structures are pushed off the plane of the Milky Way when a massive dwarf galaxy passes through the galactic disk. This passage causes oscillations, or waves, that eject stars from the disk, either above or below it depending on the direction that the perturbing mass is moving." "The oscillations can be compared to sound waves in a musical instrument," said lead author Maria Bergemann of MPIA. "We call this 'ringing' in the Milky Way galaxy 'galactoseismology,' which has been predicted theoretically decades ago. We now have the clearest evidence for these oscillations in our galaxy's disk obtained so far!" For the first time, Bergemann's team presented detailed chemical abundance patterns of these halo stars using the W. M. Keck Observatory on Maunakea, Hawaii. "The analysis of chemical abundances is a very powerful test, which allows, in a way similar to the DNA matching, to identify the parent population of the star. Different parent populations, such as the Milky Way disk or halo, dwarf satellite galaxies or globular clusters, are known to have radically different chemical compositions. So once we know what the stars are made of, we can immediately link them to their parent populations," said Bergemann. The scientists investigated 14 stars located in two different halo structures - the Triangulum-Andromeda (Tri-And) and the A13 stellar overdensities. These two structures lie on opposite sides of the Milky Way disk; about 14,000 light years above and below the Galactic plane (see Figure 1). The team obtained spectra of the halo stars using Keck Observatory's High-Resolution Echelle Spectrometer (HIRES). "The high throughput and high spectral resolution of HIRES were crucial to the success of the observations of the stars in the outer part of the Milky Way," said Cohen. "Another key factor was the smooth operation of Keck Observatory; good pointing and smooth operation allows one to get spectra of more stars in only a few nights of observation. The spectra in this study were obtained in only one night of Keck time, which shows how valuable even a single night can be." The team also obtained a spectrum of one additional star taken with the European Southern Observatory's Very Large Telescope (VLT) in Chile. These findings are very exciting because they indicate the Milky Way's disk and its dynamics are significantly more complex than previously thought. "We showed that it may be fairly common for groups of stars in the disk to be relocated to more distant realms within the Milky Way - having been 'kicked out' by an invading satellite galaxy. Similar chemical patterns may also be found in other galaxies, indicating a potential galactic universality of this dynamic process," said co-author Allyson Sheffield of LaGuardia Community College/CUNY.